How did this project get started? What inspired you to work together? How did you get started with 3D design for 3D printing? Nathaniel Ryan:“I use Blender 3D for all my modeling and used the swords to also learn how to print them, it took some trial and error, but have been extremely satisfied with the quality and precision that Shapeways printing provides. I have also been doing 3D modeling for several years as freelance. you can find some of my work at ArtStation, Pinterest, Facebook, or FullyCroisened. What are the challenges you find in recreating Mike’s swords for mini figures? Nate Ryan: “Due to the small scale, to maintain thickness, etc, sometimes I need to take some liberties on the actual details of the 3D printed versions. I try to get as close as possible to the original giant swords. Also before we enable it to the public, we print several versions until we get it to a quality level we are happy with. That process can take some time, but we want to get a repeatable and reliable print design before we make it available for purchase. Mike, how did you feel when you saw the swords printed as miniatures for the first time? 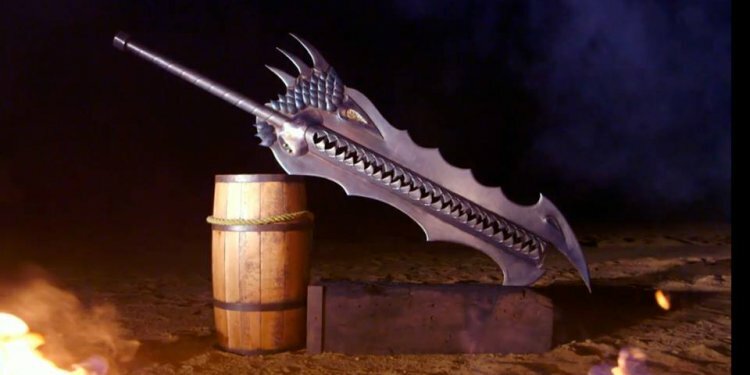 Michaelcthulhu: I get a massive kick out of seeing the tiny swords, obviously. Not everyone can afford a massive sword, so it was cool to finally have a small piece of Mikemorabilia that people could actually afford. The wonders of the age we live in or whatever, even if I could make small stuff with this fine of detail (which is questionable when your primary tool is an angle grinder) it would still be out of most peoples price range cause of the time it would take me to do it. I’ve gotten messages from people who have bought these for their kids, warm cockles etc. They’re so much cooler than a Michaelcthulhu T-shirt or Mug, in my humble opinion. Also bonus for me: Nate did all the hard work! The 3d modeling work done by Nate is just as baffling to me as what I do is to most people. Let’s say Nate had never sent me his Rahab model pictures, at some point it might have occurred to me to pay some random guy to make the model, uploaded it to a Shapeways account and prayed it all worked. But if there was a problem with the model? Or if I wanted to modify the model in some way later on? Not a hope, I would have been totally stuck. These little swords only exist because of Nate. Is there a moral? Keep sharing your stuff with people I guess?